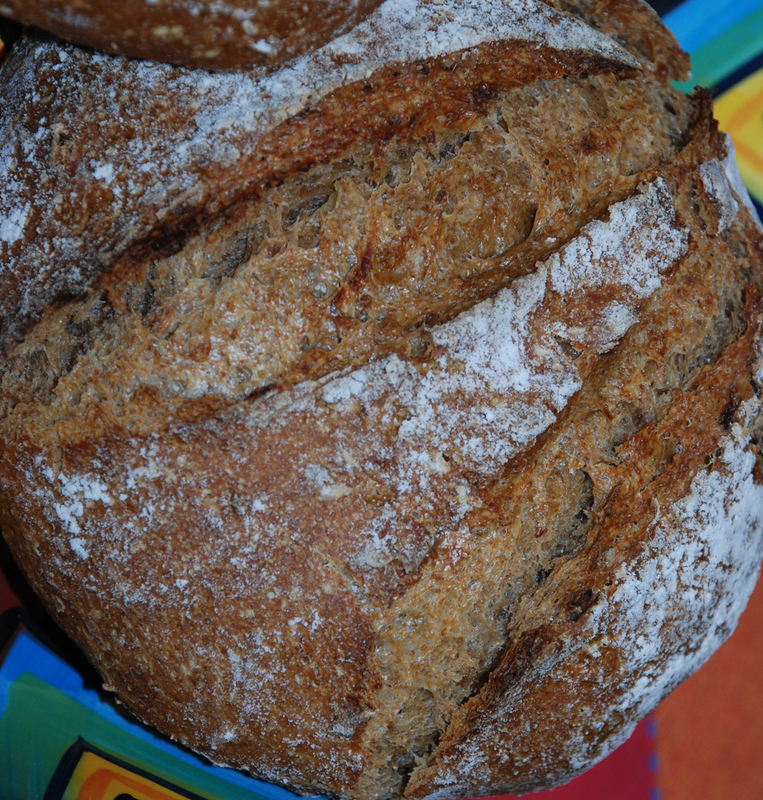 My first attempt this bread I concocted came out excellent with a nice moist open crumb and crisp crust. 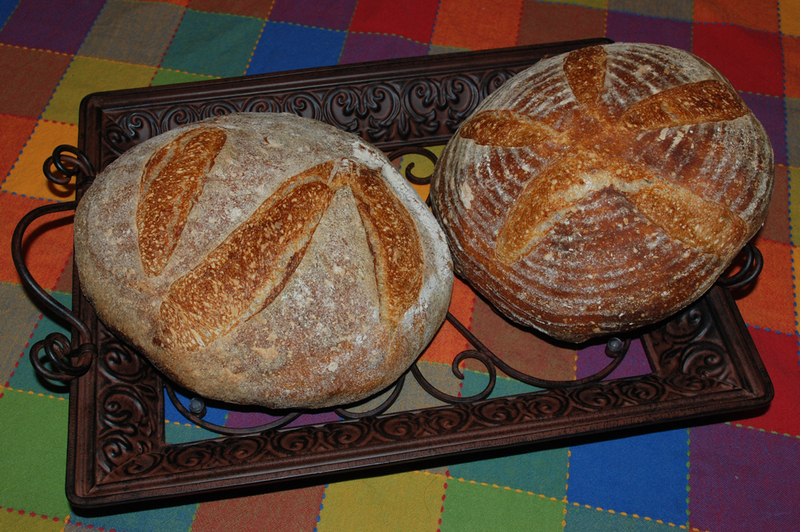 I decided it was time to try it again and change-up some of the flours and grains used in the soaker. I just picked up some Bulgar Wheat so I decided to add that to the soaker along with rolled oats, malt rye berries, oat bran and cracked wheat. 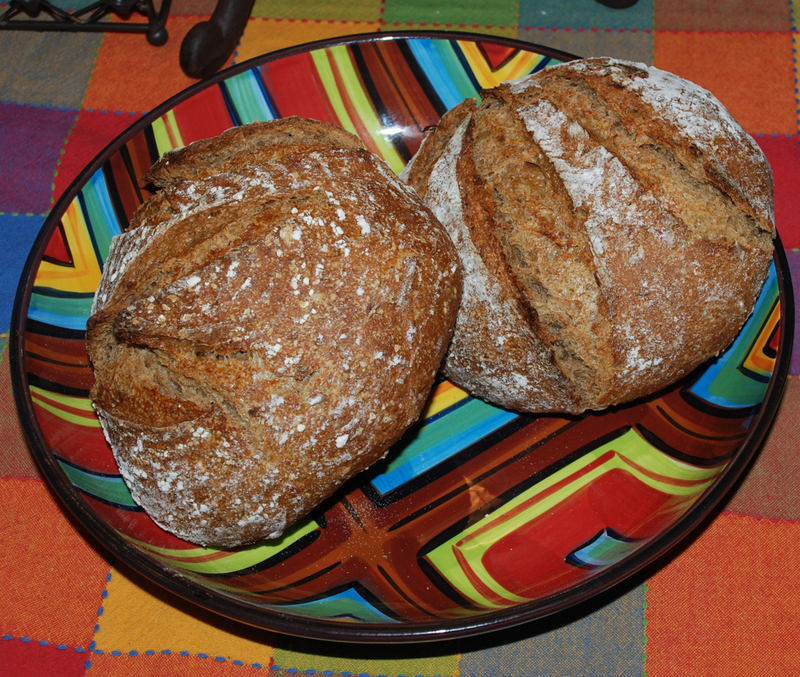 I also used a different mix of flours including spelt which has become one of my favorites due to its nutty flavor. 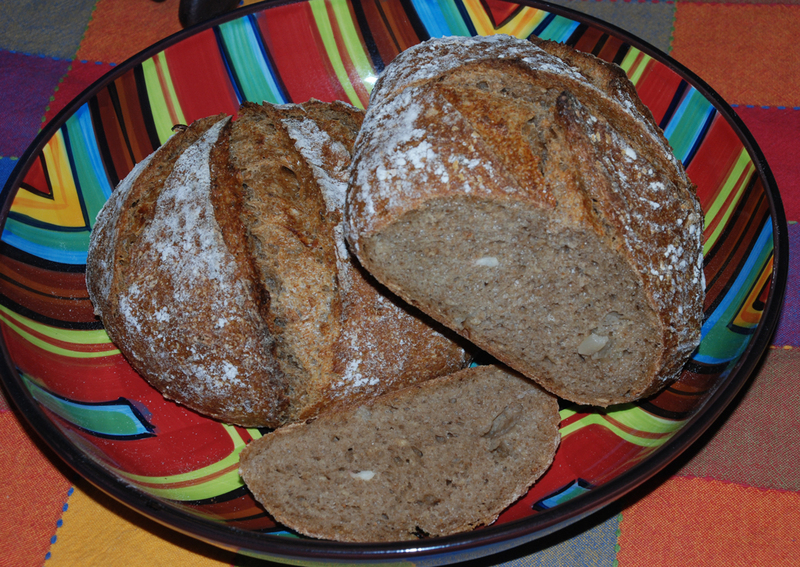 I used pumpernickel flour instead of medium rye as well. In trying to calculate the bakers percentages for this recipe I included all the water from the soaker, final dough and also the water from my refreshed 65% hydration AP starter. 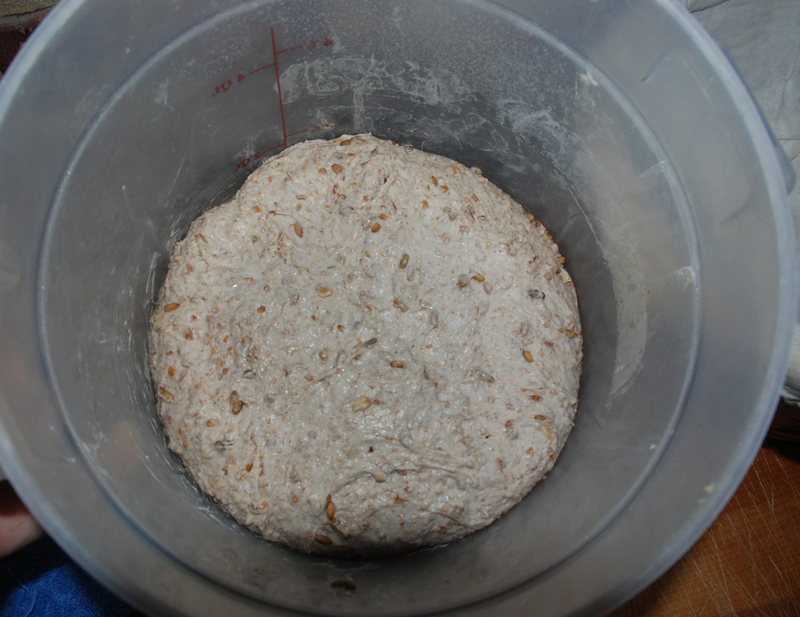 When I calculated the water from the starter it also included the water from the seed starter which I’m not sure it that is necessary or not, but the overall hydration of this dough ended up being 86%. 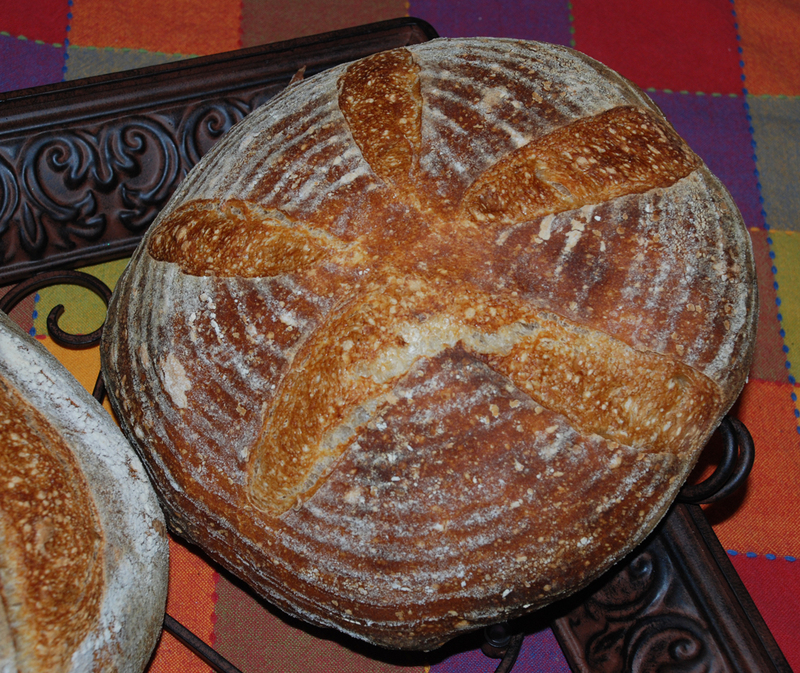 If you are not comfortable with wet doughs, you may not want to try this one. I do have to say that a lot of the water is absorbed by the soaker so it’s not really as wet as it sounds. 173 Grams Water, 90 degrees F.
I was in the mood for something simple and relatively uncomplicated to bake so I decided to make some baguettes based on the Peter Reinhart method from ABED which uses a long overnight ferment of the bulk dough. Of course I couldn’t leave well enough alone and had to add something different to make it more interesting. 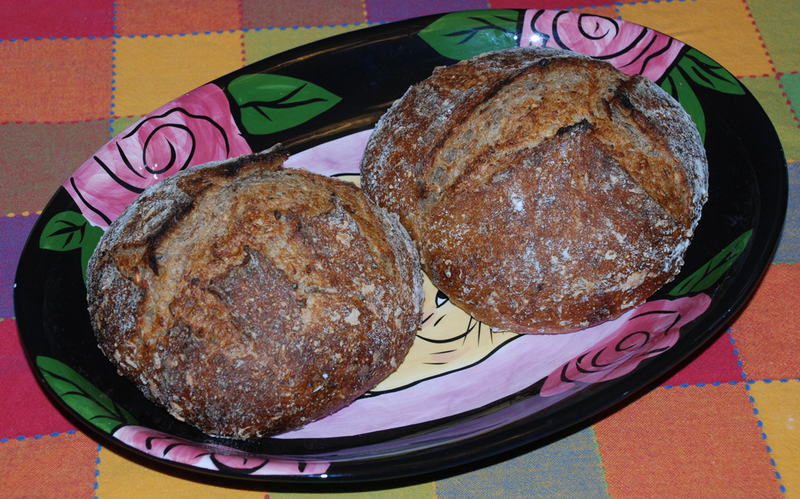 I just picked up some quinoa flour from the supermarket which imparts a nice nutty flavor to the dough. 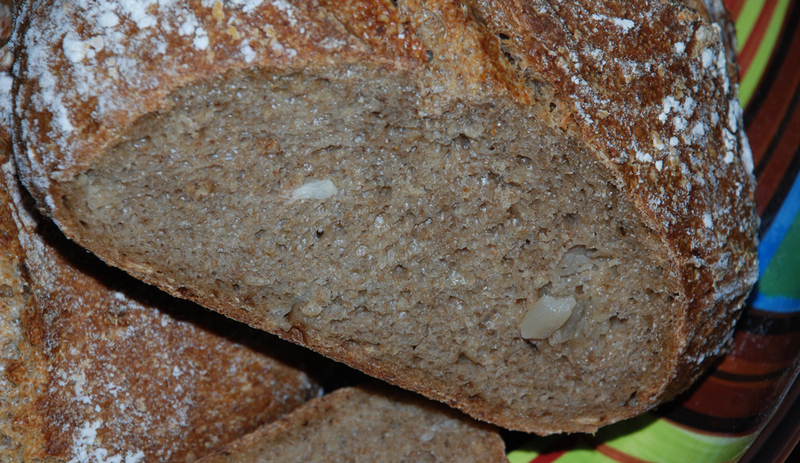 I also added some low protein Italian style 00 flour from KAF along with some organic whole wheat and bread flour. 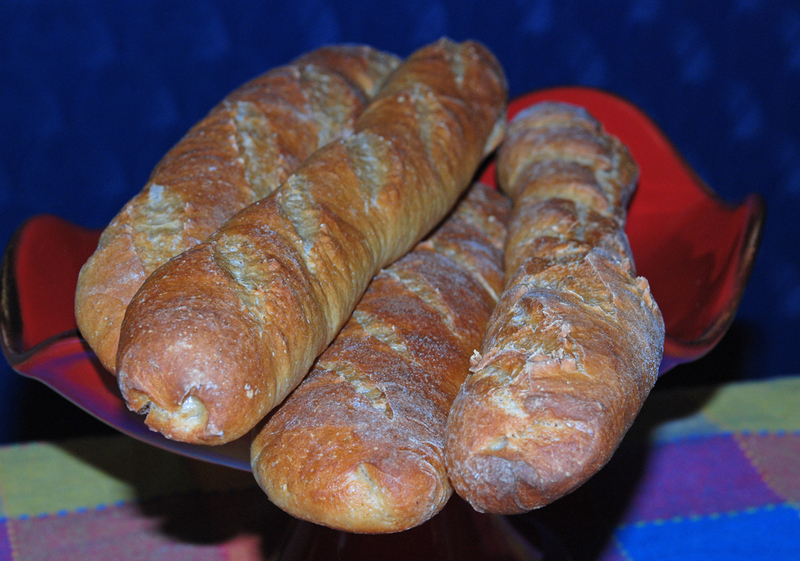 The end result was a nice crispy, light and nutty flavored baguette. I still need some practice with my shaping and figuring out how long to make them so they fit on my oven stone. 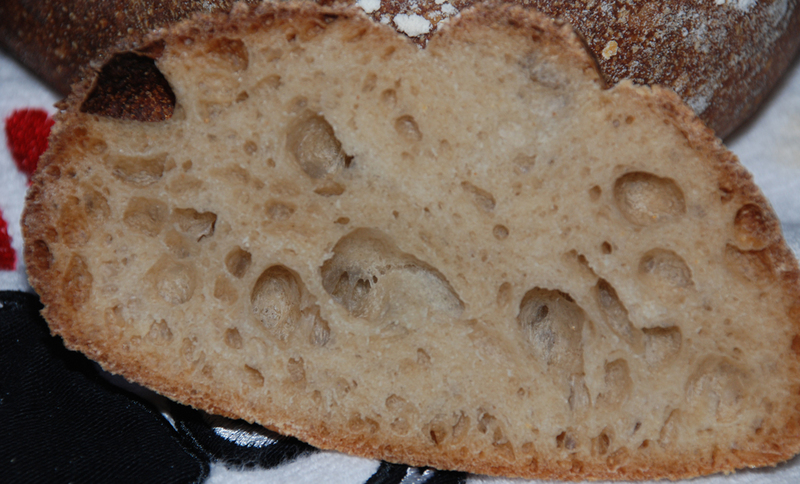 I could have handled the dough a little lighter to preserve some bigger holes, but overall the crumb was not bad and the crust was nice and crisp. 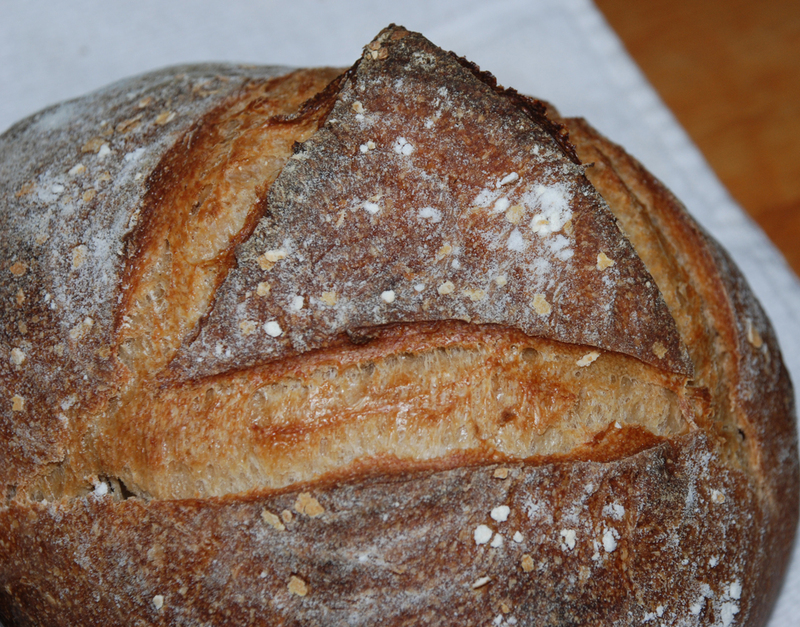 Using your stand mixer or by hand, mix the water with the flours for 2 minutes on low. Let the dough autolyse for 30 minutes. Add the salt and mix for 2 minutes more on medium speed, adding more flour if necessary to produce a slightly sticky ball of dough. When ready to bake the bread, shape the dough as desired being careful not to handle the dough too roughly so you don’t de-gas it. Shut the oven off and crack the door with the bread still present. 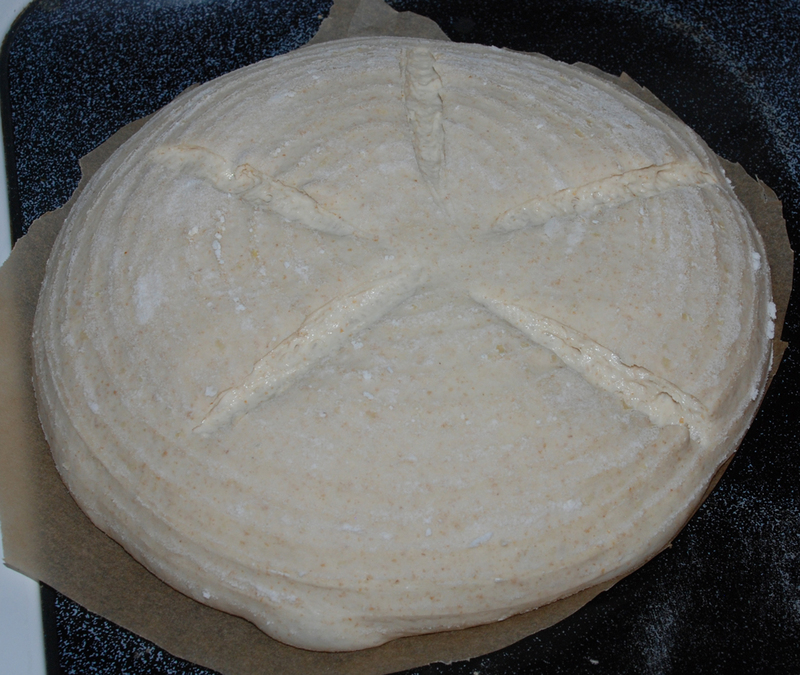 Let it sit for 10 minutes to continue to dry out and develope the perfect crust. 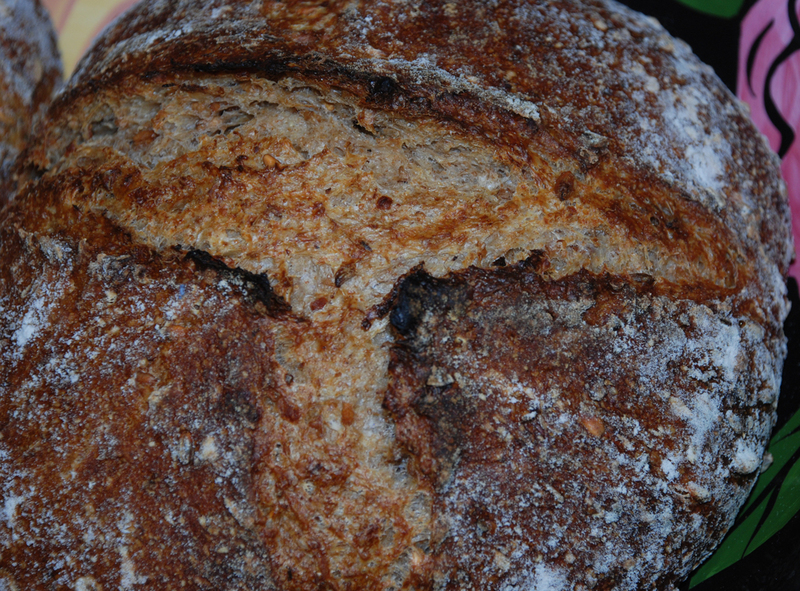 I love cherries and I love vanilla, so what better flavor combination to try to work into a bread recipe? I have never incorporated a liquor into a bread dough before, so I’m not sure what to expect, but I do have to say it smelled fantastic mixing it up. I started by taking my 65% hydration AP flour starter and building enough starter for 15 ounces of levain for the finished dough. I wanted to incorporate some white rye into the starter to give it a little rye flavor so I added 22% white rye flour to the levain build along with AP flour and some water to make a 67% hydration starter. The final dough including the starter has a hydration level of 66%. 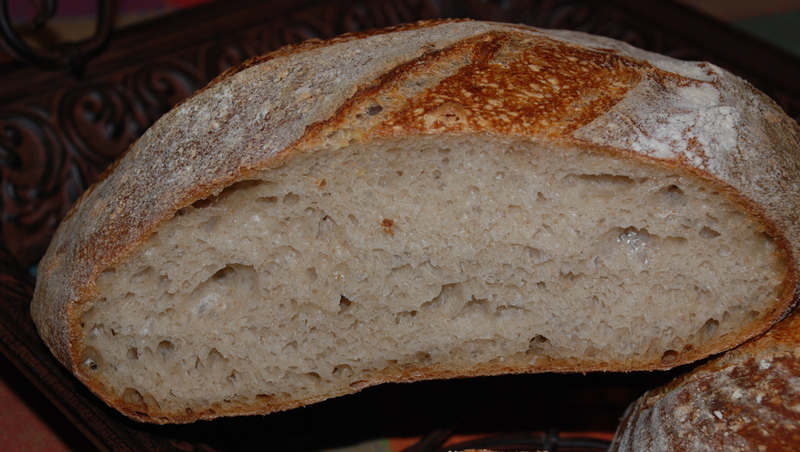 I wanted to try to make this a moist and delicate crumb so I incorporated a large percentage of French Style low protein flour from KAF, along with a small percentage of white rye and durum flour. After finishing the loaf in the oven and tasting it, I have decided that I added a little too much of the Cherry Marnier and vanilla so I have adjusted the amount in the recipe below. 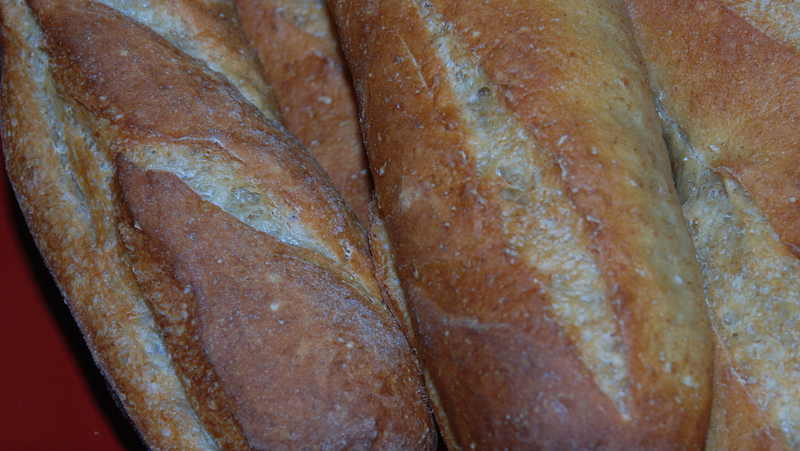 This is a perfect bread for french toast or bread pudding or just as toast with some butter or cheese. Add the flours and vanilla extract and Cherry Marnier and mix on the lowest speed for 2 minutes. 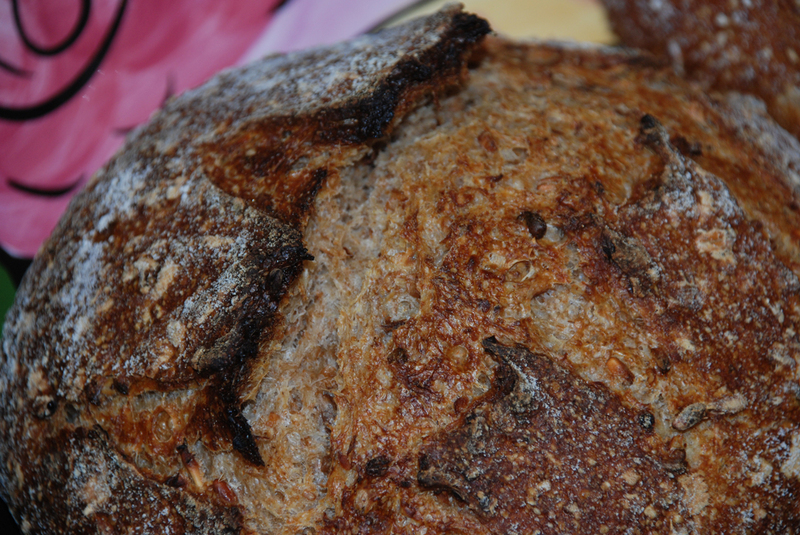 Let rest for 15 minutes – 20 minutes to allow the gluten to develop. Next, add the salt and mix for 4 minutes more on medium speed, adding more flour if necessary to produce a slightly sticky ball of dough. Let the dough rest another 10-15 minutes and do a stretch and fold again. Let it rest for an additional 15 minutes and do 1 more stretch and fold. After this last stretch and fold cover the bowl again and let it rest at room temperature for 1.5 to 2 hours and then put it in your refrigerator overnight or up to 3 days. 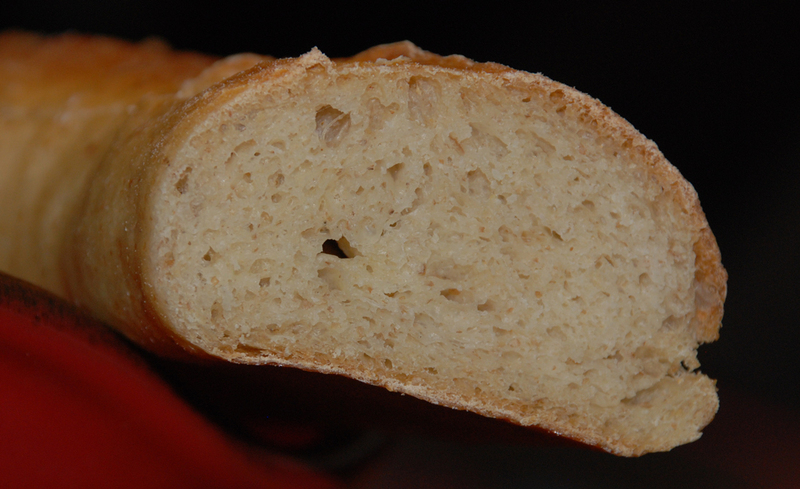 The final dough had a nice open crumb and crispy crust. 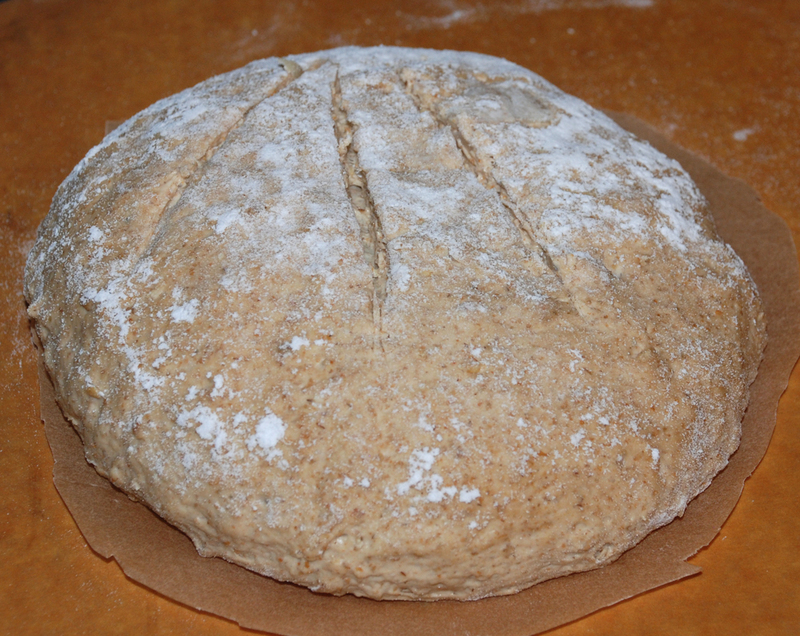 The overall dough did not rise as much as I would have liked, but the oven spring was excellent. Next time I think I would add some dried cherries and maybe some walnuts to kick it up a bit. After reading about Dave’s never-ending quest to create the perfect San Francisco Sourdough bread I felt it was time to give his latest recipe a whirl. I have never been to SF so I don’t know exactly what the final bread should taste like other than by his description. I tried very hard to follow his exact recipe but alas my string of good luck continued and my refrigerator decided to mimic an oven. I was forced to let the bulk ferment dough rest in my mini beer/assorted alcohol refrigerator instead of the shaped loaves. 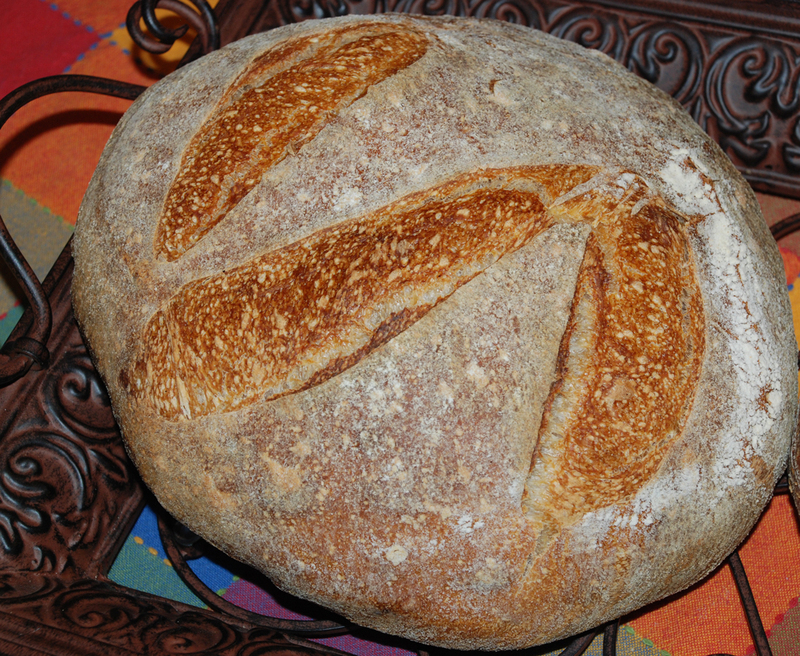 I let the dough bulk ferment over night and the next afternoon while I waited for my refrigerator to be fixed I let the dough rest at room temperature for a couple of hours. 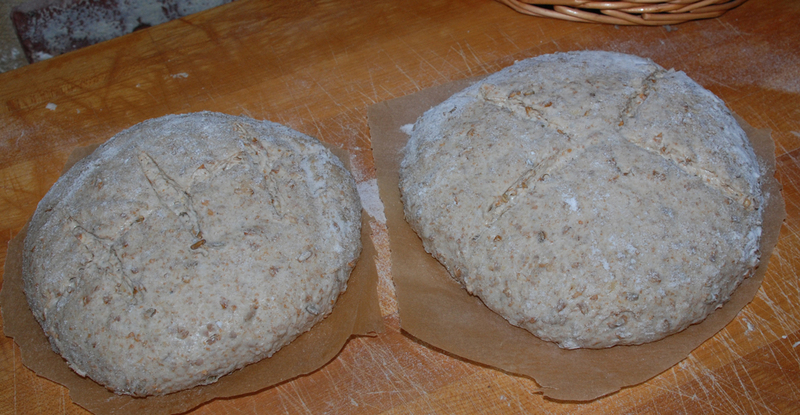 I then formed the loaves into Boules and let them rise in their bannetons inside my oven with a bowl of hot water for 3.5 hours. The dough was nice an elastic and puffed up very nicely. Unfortunately I didn’t realize that the risen loaves would be too big to fit in my oven at the same time. I had to adjust the loaves while the oven was nice and hot and subsequently one of the loaves was hanging off the baking stone for a few minutes causing it to sag slightly. 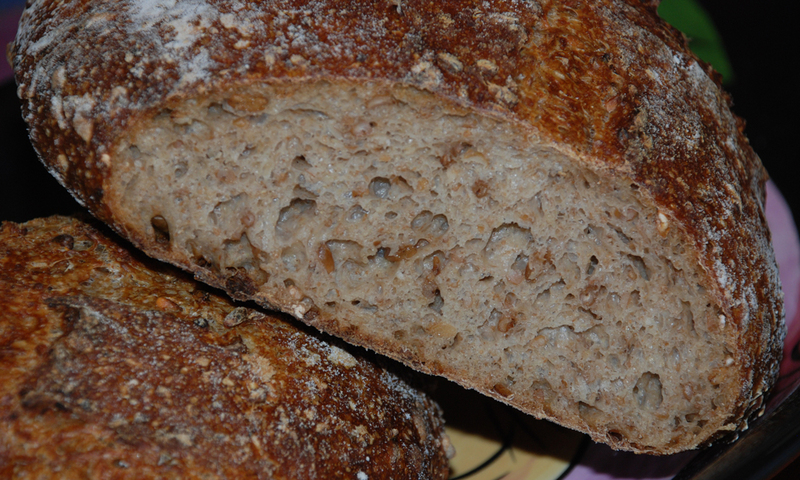 The final result was an excellent crust and a nice open and light crumb. I did however discover the first loaf I cut into had a mysterious hole running through a big part of the bread, almost like someone or thing was trying to dig its way to China. 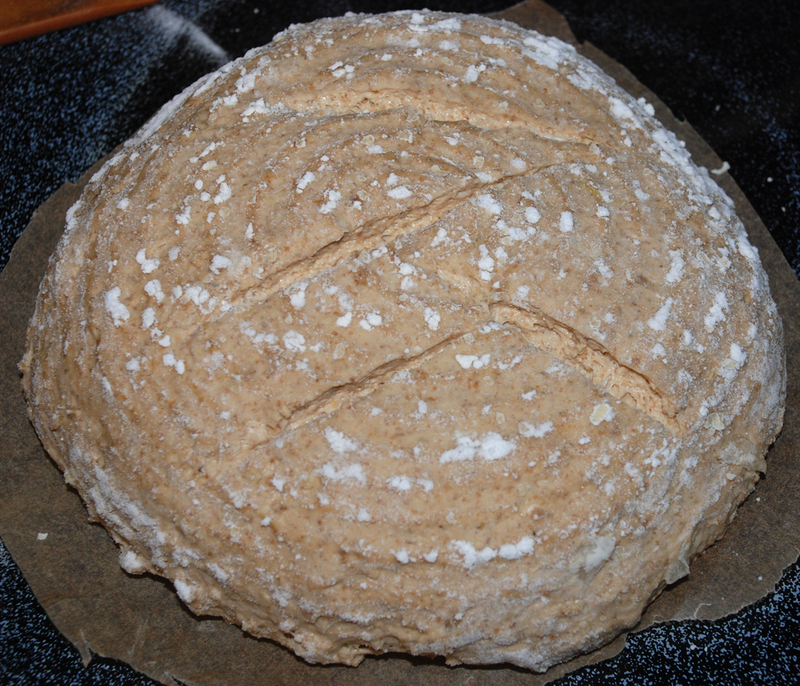 Overall the bread turned out excellent. I would have expected it to be slightly more sour though and I’m not sure why it was so mild. It could be due to the fairly new converted starter I used. 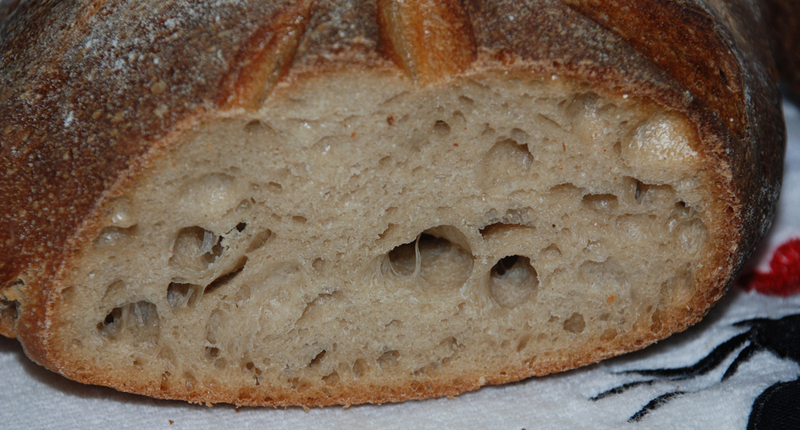 I turned my 65% AP starter to Dave’s multi flour starter at 50% so maybe it wasn’t mature enough. 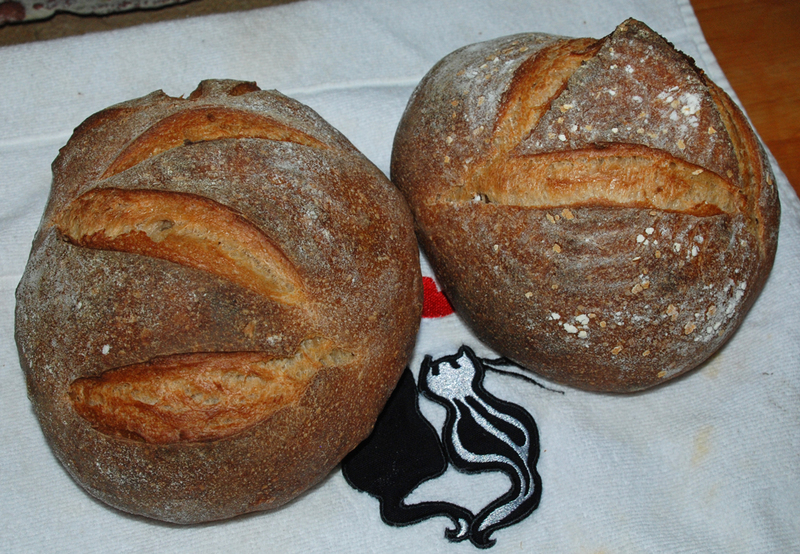 You can find Dave’s recipe here: http://www.thefreshloaf.com/node/27982/san-franciscostyle-sourdough-bread-two-ways-3252012. Thanks again Dan for an excellent recipe!